Dr Karen Galea will give a presentation on IMPRESS design and up to date results at the International Fresenius Conference “Worker, Operator, Bystander and Resident Exposure and Risk Assessment”, taking place in Mainz, Germany between 6 and 7th of December 2018. The Independent Advisory Board held its second meeting with the project team on 11th December 2018, with the project team meeting the Sponsor, ECPA, on the 12th December 2018. Copies of the minutes and the Advisory Board’s independent report will be made available early 2019. The World Medical Association’s Declaration of Helsinki 2013 states in article 35: Every research study involving human subjects must be registered in a publicly accessible database before recruitment of the first subject. We have registered the IMPRESS project at https://www.researchregistry.com (ID: researchregistry4292) and will update this public repository with details of the project accordingly. Dr. Johan Olander delivered an oral presentation at the X2018 conference summarising the preliminary study results acquired from a review study performed as part of WP1 (Review the methods and techniques of exposure assessment in occupational epidemiology) of the project. Overall, 2314 papers were included in an analysis demonstrating that indirect methods of exposure assessments remain the norm for pesticide epidemiology. Increases in the use of self-reported exposures and Jeb-exposure matrix applications have also been recorded. A copy of Dr Ohlander’s complete presentation can be found on our Conferences/Publications page. An overview of the project was also provided at the same conference in the form of a poster presentation by Dr. Ioannis Basinas. A copy of the poster is available on our Conferences/Publications page. IMPRESS was included in Professor John Cherrie’s presentation within the PRE-COURSE ON: MODERN METHODS IN OCCUPATIONAL EPIDEMIOLOGY held as part of the European Educational Programme in Epidemiology (EEPE). The pre-course was a training school co-ordinated by COST Action CA16216 “Network on the Coordination and Harmonisation of European Occupational Cohorts” and took place at Florence, Italy, between the 11-15 June 2018. A copy of his presentation can be found here. IMPRESS will have two presentations at the X2018 conference taking place in Manchester, UK including a poster presentation on the design of the study and an oral summary of the findings of WP1. 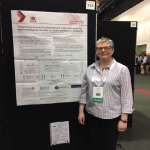 IMPRESS was presented by Kate Jones at the 32nd International Congress on Occupational health, which took place in Dublin, Ireland between April 29 – May 4, 2018. A copy of the submitted abstract can be found on our Conferences/Publications page. An overview of the project was presented at the ECCA-ECPA – Crop Protection European Regulatory Conference by Dr Ioannis Basinas. The conference took place in Brussels 7-8th March 2018. A copy of the presentation can be found on our Conferences/Publications page. Dr. Karen Galea will be presenting an overview of the project at the ECCA-ECPA – Crop Protection European Regulatory Conference, taking place in Brussels 7-8th March 2018. Kate Jones presented a poster introducing the project at the ISBM conference Naples, 1-4 October 2017. A copy of this poster can be found on our Conferences/Publications page. This three year project has officially started and the project team are very excited to commence work. The project team will meet with the Advisory Board later in 2017 to discuss our plans and progress to date.